In a modern enterprise architecture, gaining access to data that’s stored in multiple locations is crucial to delivering analytics. It shouldn’t really matter if the data is stored in your database or some other location in ORC or Parquet formats. Performing analysis on it without having to first copy it can be a very powerful capability. 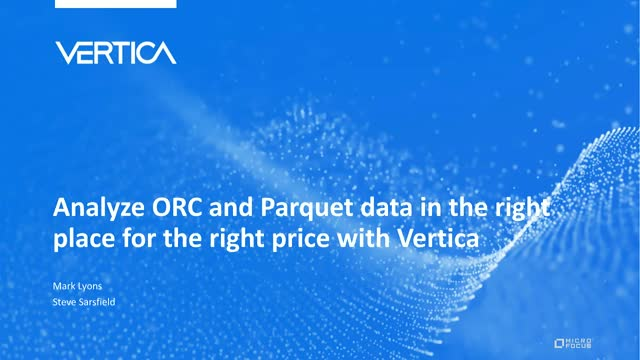 Join Vertica experts Mark Lyons and Steve Sarsfield as they talk about how the external tables feature of Vertica can save you time and effort in many day-to-day analytics tasks. Whether you’re joining internal databases to external data tables for additional insight, training machine learning models, or simply tiering less critical data analysis off to a less expensive storage location, external tables can speed you through this task. In this webinar, you’ll also learn how external tables are a fantastic way to keep costs low yet maintain easy access to data of almost any age and any importance.